Works as described, well made. Although the keys fit into the pouch rather a snug fit there is not much room for payment cards. I've only had this a short while and it seems to be doi g the job. A bit of peace of mind that addresses very well the problem created by poor manufacturing of our new cars coupled with a minority section of our country intent on taking what is not theirs to take . However if you keep your house keys on it then they wont fit. Does exactly what it says on the tin,good value for money. It does what it says Brilliant thanks. A very good item at a great price. RFID pouch works 100 percent ,great product. Well made RFID pouch that looks good. Works well, 100 percent effective in blocking signals. It does work, unless I take the key out of the pouch I am unable to get into the car. Large enough to take my whole key ring with flap closed which must be a bonus. We have one each. 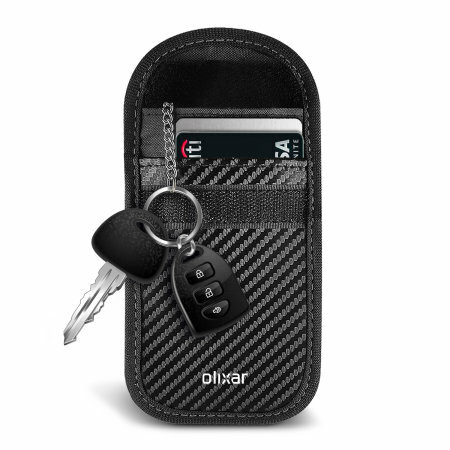 How is it that i can happily open my car by pressing the key fob while inside the wallet? surely the wallet should prevent the transmission to the car? Never thought about my Car Key being hacked. I'm glad I saw this item. I told my family and friends straight away. The pouch is well made and reasonably priced. Buy one or more now! This pouch has given me so much peace of mind since seeing all the horrible car jacking stories in the press recently. Knowing my car is safe from this type of crime is a real benefit, plus the actual pouch is really good too. Fits my keys in neatly along with a few other items. The design looks great and the size is ideal of use out and about as well as just leaving in the house. I just wish Olixar did a twin pack!